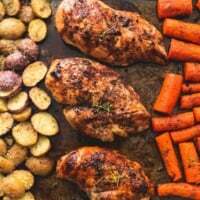 This easy Sheet Pan Balsamic Chicken with Potatoes and Carrots will have your entire family begging for more. As far as one pan meals goes, this is the epitome of ease, flavor, and versatility! Preheat oven to 400 degrees. Arrange potatoes in a single layer on one third of a greased sheet pan, chicken on one third of the pan, and carrots on the remaining third. In a medium sauce pan bring balsamic vinegar and honey to a boil. Cook for about 5 minutes until reduced by half, then remove from heat and pour into a heat-safe bowl. Drizzle oil over the potatoes, chicken, and carrots. Rub the oil over the chicken with your fingertips. Season potatoes, chicken and carrots with salt and pepper to taste, garlic powder, basil, and thyme. Spoon half of the balsamic sauce over the chicken. Sprinkle parmesan cheese over the potatoes. Bake for 20-25 minutes until chicken is cooked through and carrots and potatoes are tender. Drizzle remaining balsamic sauce (it should be slightly thickened now after cooling) over the chicken and carrots and serve.